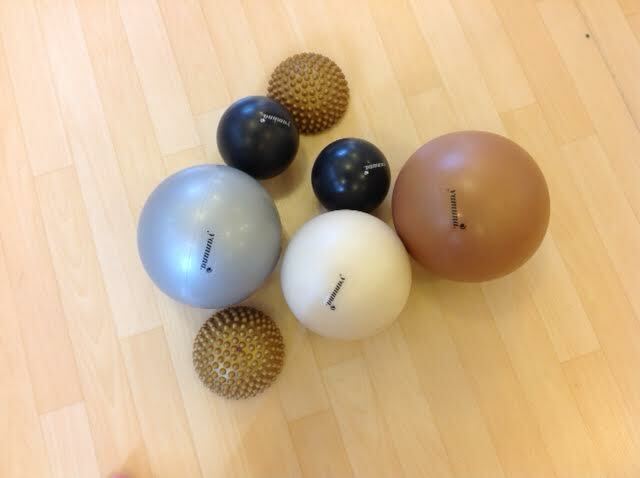 Using specially designed Yamuna balls of various sizes and textures the systematic routines elongate and tone muscles, free up musculoskeletal tension and discomfort, increase blood flow and lung capacity, and promote healing from everyday wear and tear. Using specific balls for specific routines makes it possible to work muscles in detail from origin to insertion. The result is a self-massage that uses your own body weight and the traction from the balls to release tight areas and increase your 360 degree body awareness. Yamuna Balls and foot savers Deep and gratifying hamstring release! The Yamuna Body Rolling work in Pilates privates or Pilates classes can easily be integrated into any other activity that you do. Similar to Pilates, the Yamuna work aims to undo poor postural habits. The focus is to stretch, release and free up the bones and muscles so that you are working the body from a more correct alignment so poor movement patterns/tension patterns are not reinforced. You’ll see how your overall performance will improve! If you have old or new injuries to nurture, Yamuna Body Rolling at Pilates on Fifth will offer you resources to support recovery. shoulders from sitting at a computer, poor postural habits and stress. from sitting or standing too long. A Yamuna Body Rolling session will be a great complement to your Pilates privates or group Pilates classes at Pilates on Fifth. Your focus will be on your breath as you use your weight on the balls to stimulate bone and release muscle. You’ll experience a strength and openness in your body that you’ll be able to transfer to your Pilates practice. Try a Yamuna Body Rolling class before one of the other classes at Pilates on Fifth—or try it afterwards. Whatever you choose, you’ll feel the qualitative improvement to your training practice. A real plus of the Yamuna work is that you can do it anytime, anywhere. Throw a black or pearl ball into your bag and do some refreshing rolling at your desk, on the plane, during a break, in a chair, on the floor and in your bed too!